Traditionally, framing accounts for about 15 percent of the total cost of home construction. 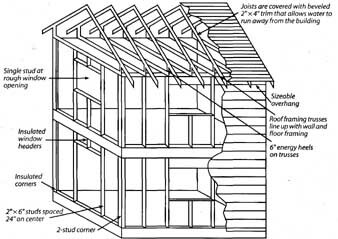 Advanced framing techniques (AFT) uses engineering principles to minimize material usage while meeting model building code structural performance requirements. Using these framing techniques to reduce the amount of framing material by up to 20 percent allows you to better utilize resources while saving material and labor costs. • Increase wall stud spacing to 24 inches on center (o.c. ), rather than the standard i6 inches. This uses fewer framing members, therefore saving materials and labor costs. • Space floor joists and roof rafters at 19.2 or 24 inches instead of i6 inches to save floor joist material (more space means less material) and labor. • Use inline framing, in which floor, wall, and roof framing members are in line with one another and loads are transferred directly to the foundation (sometimes called “inline” or “stack” framing). This technique enables you to use the engineered strength of the material to transfer point loads, thereby eliminating the need for large headers in load-bearing walls. Check with local codes to make sure this is permitted on your project. • Design homes on two-foot modules, thereby reducing cutoff waste and installation labor, since most panel products come in even-incremented dimensions such as four by eight feet. • Use two-stud corner framing instead of three-stud, and replace two- and three-stud backing for drywall attachments at wall “T” intersections with inexpensive drywall clips or scrap lumber. Three-stud corners are the traditional standard due to relative ease of applying drywall, but by using two-stud corners with drywall-clips to hold the drywall, you use less wood while effectively supporting the drywall. This also gives additional room for insulation, raising the whole-wall R-value. • Carefully size headers used to support the load above an opening. Builders typically use two-by-tens simply because it is the industry standard, but smaller sizes are adequate and save material. • Eliminate headers in non-load-bearing walls. They are not needed, because a header’s sole job is to protect the opening from the load above. • Substitute 2” x 6” studs (24” o.c.) for conventional a 2” x 4” (16” o.c.) framing. By using 2” x 6” studs, you save time and labor costs (offsetting slightly higher per-item material cost), since they are 24 inches as opposed to i6 inches apart. The increased spacing allows for additional insulation in wall cavities, which improves thermal resistance and saves you money on energy bills. • Space roof rafters at 19.2 inches or 24 inches to save on roofing materials. • Use trusses instead of stick-framed roofs. With trusses, builders can use 2” x 4” lumber. This saves the larger dimensional wood from old-growth forests that is typically required for stick-framed roofing rafters. • Install energy heels of 6 inches or more on trusses to allow for increased ventilation and insulation. • Provide a sizable overhang to shade your home and prevent precipitation from damaging the siding of your home. Knowledge of these advanced framing techniques is key to saving money and resources on your project. Additionally, intelligent material choices detailed in the following section will further save precious wood. • As demands on forest resources have increased, non-forest sources of wood have grown in importance. High-quality reclaimed wood can be salvaged from places such as buildings slated for demolition or rivers, where sinker logs sank decades ago during river-based log drives. Reclaimed wood is often available in species, coloration, and quality not found in today’s forests. It is not tied to recent timber harvesting, it reuses materials, and it can reduce the construction and demolition load on landfills. • Recommendations: Use reclaimed lumber (in place of new material) for nonstructural applications. For structural applications, look for reclaimed lumber that is engineer-stamped and graded. The supplier may require you to pay for an engineers grading and stamping. In some cases, reclaimed wood suppliers have only limited quantities of woods with matching coloration or weatherization patterns. Ample lead time and accurate materials estimates can help ensure availability of the desired wood. • The FSC is an international nonprofit organization that accredits certifiers and promotes standards for sustainable forestry certification worldwide. The FSC’s principles include management for biological diversity, long- term forest health, and the long-term economic well-being of local communities. FSC certification guarantees that forests are managed in a way that assures the long-term availability of precious woods and does not clearcut large sections of old-growth forests. (See “Certified Wood” in Section 5). • Recommendation: Use FSC-certified wood whenever new wood framing is required. You may have to order the lumber if it is not stocked by your local lumberyard. Allow sufficient time for delivery before the framing starts. Solid-sawn lumber in sizes of 2” x 10” or greater typically comes from old- growth forests, because these are the only trees that can produce such large-dimension wood. However, engineered lumber products can now be produced efficiently from small-diameter, fast-growing plantation trees. 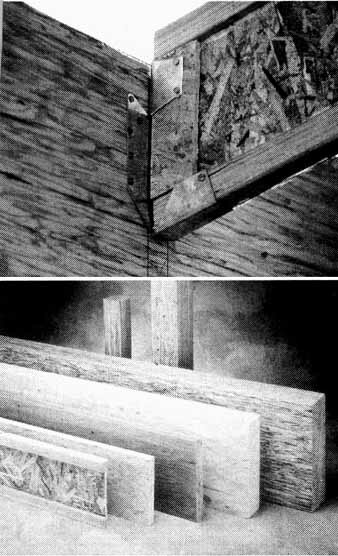 The small pieces of wood are combined with adhesives under heat and pressure to produce practical and economical alternatives to plywood and solid wood framing in sheathing, headers, beams and joists. Inevitably, the compressive manufacturing process involved in engineered wood is expensive: more than 1 cubic foot of younger lower quality raw wood must go into each cubic foot of engineered wood products, along with a good deal of energy, typically derived from wood wastes. However, the benefits outweigh the costs; engineered buildings are built more quickly and easily. They offer consistent performance, predictable quality and dimension, and superior structural integrity with minimal construction waste. Engineered lumber uses wood fiber more efficiently than conventional lumber some mills can use 95 percent of the tree! Moreover, reducing demand for large-dimension lumber decreases pressure to cut down old-growth forests. • Use Glulam beams. These glue together a number of layers of solid wood members to replace ‘ x 6” or larger solid beams. 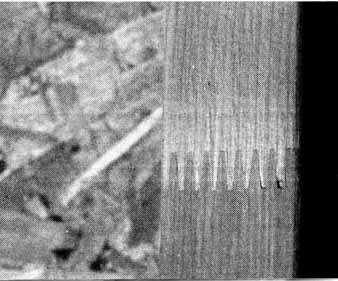 You can also achieve better results by sandwiching carbon-fiber, steel, or other strong materials in between layers of wood. Glulam beams combined with carbon fiber can save two-thirds of wood previously required, cut total costs, and make light, airy beams attractive for large structures. There is a wide variety of engineered wood products available for framing including wood I-Joists (a) laminated veneer lumber glue laminated lumber oriented strand board and parallel strand lumber (b). Use Oriented Strand Board (OSB) for Subfloor and Sheathing. OSB is manufactured from fast growing farm trees, whereas plywood is made by shaving sheets of wood from large, old-growth logs. OSB comes in sheets and is used for sheathing and subfloors. • Use Wood I-Joists for floors and ceilings. Wood I-joists are engineered to use only the wood fiber necessary for the structural function required. They typically use OSB for the web and either laminated veneer lumber or solid-sawn lumber for the chords (top and bottom pieces). Wood I- joists use o percent less wood fiber to perform the same structural function as similar-sized solid-sawn lumber, and will never twist, warp, or split. They are stronger and lighter than 2” X 10” or 2” X 12” lumber and they can span greater distances. • Use Engineered Studs. Engineered wall framing systems use wood studs made by pressing together small-diameter, low-grade hardwoods. They are also four times as strong and more predictable than commodity-grade studs. Additionally, they are straighter and free from knots, defects, or other irregularities that can compromise quality construction. Engineered studs can be used wherever conventional studs are typically used in vertical applications, particularly when straight walls are critical, as in kitchens where cabinets will be hung. • “shimming” walls so the drywall is straight. Finger-jointed studs are cost- competitive and can recover 500 to 700 board feet of good dimensional lumber from each one of previously wood waste. Use finger-jointed studs in place of conventional studs in vertical applications only. Use of finger-jointed studs may need to be submitted to your local structural engineer for approval. Finger-jointed studs eliminate crooked walls and reduce material waste. SIPs are constructed of a rigid foam core sandwiched between two sheets of OSB. SIPs are more energy efficient, provide better soundproofing, and reduce infiltration relative to frame const-ruction. They save wood and can be erected more quickly. Although panelized walls (and roof panels) are more expensive initially than buying raw materials for conventional construction, the resulting savings in site labor, material waste and cleanup fees, and shorter construction timeframes offset much if not all of the costs of the panels. Likewise they may cost more initially due to the insulation component but again that cost is largely offset when compared to adding the insulation on site. Keep in mind that SIPs are not easier to disassemble reuse or recycle. • Recommendations Use SIPs for structural exterior walls roofs and floors in place of stick framing. Generally, almost any addition plan can be modified to be built with SIPs. • Select a company that optimizes panel utilization by using, for example computer assisted drawing (CAD). • Store panels under cover out of the sun and off the ground. • Use panel scraps for constructing headers, filler sections above windows and for other uses. • Use adequately thick panels to ensure energy efficiency. • Specify panels that are provided with special foam sealing channels — or another comparable system — for sealing between panels during erection to avoid moisture and air migration. • To further seal panels tape interior and exterior panel Joints with quality construction tape. • Use panels with foam treated against insect infestation especially in the southeastern U.S.
• Plumbing and electrical runs need to be predetermined so the manufacturer can accommodate these needs by forming chases inside the foam to run wire or pipes. Use advanced framing techniques (AFT). Use structural insulated panels (SIPs).